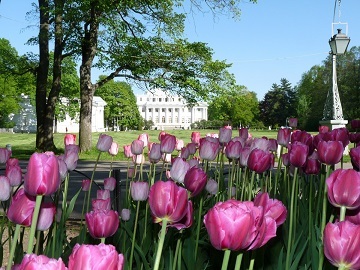 On the 14th and 15th of May the SM Kirov Tulip Festival will be held in Yelagin/Elagin Park. This floral celebration is named after the famous Soviet Bolshevik, Sergei Mironovich Kirov. This festival will be a celebration of rare, historical varieties of these flowers. 11 out of 95 of the varieties were cultivated as far back as the 18th and 19th century and are now in limited numbers, in the private collections of cultivators. Many of these tulips have ancient and regal names : Duc van Tol, Victoria and Imperial Crown were originally grown on Elagin island to decorate the palaces of St Petersburg on state occasions, most especially for the marriage of Tsarevich Alexander Alexandrovich and the Danish Princess Maria Sophie Frederika Dagmar ( Maria Feodorovna). The 150th anniversary of this event will be celebrated in a separate exhibition. The flower beds will cover 2100 sq m and will contain 130,000 bulbs which, it is hoped, will continue to bloom into early June. The festival opens with a promenade concert and will feature display, exhibitions, art installations, concerts and workshops relating to different periods : Baroque, Rococo, Classicism, Empire and Art Nouveau. There will be a charge for entry, however, visitors in fancy dress costume relating to the aforementioned eras, will not be charged. This is an opportunity to see a splendid floral 'feast for the eyes' and to buy handmade products and floral gifts.